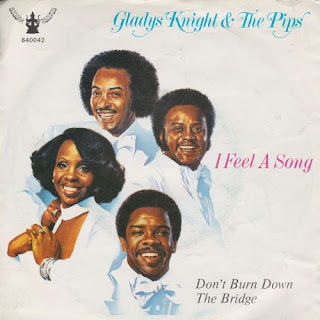 Gladys Knight has certainly been performing almost all of her life. She made her first appearance in 1952 at the age of seven on the Ted Mack Amateur Hour and, in 1957, signed with her group The Pips to Brunswick Records. In 1961, they had their first national hit with Every Beat of Your Heart on Vee-Jay Records but it wasn't until they signed with Motown in 1966 that they started to consistently chart. They reached the top ten with I Heard It Through the Grapevine, If I Were Your Woman and Neither One of Us (Wants to Be the First to Say Goodbye) but, in 1973, left the label for Buddah where they scored four straight top five pop hits. The song that broke that string, "I Feel a Song (In My Heart)", only made 21 on the Hot 100 but, on the R&B Singles, it went to number 1 forty-three years ago today on November 30, 1974.